Arsenal 3 v 0 Sunderland: Half Time Analysis. With the Bayern game fresh in everyone’s minds, we really need to bounce back against Sunderland today, and it looks like we’ve done exactly that after a fantastic first half performance. Sunderland seemed incapable of dealing with the quick tempo of Arsenal’s passing game, getting nowhere near the ball as we pinged it around the edge of the visitors box. It wasn’t long before Arsenal turned their dominance into a lead, Giroud getting himself on the scoresheet on his return to the side after a two game absence. Wilshere was looking bright in the opening minutes, and it was his driving run and off the ball movement which crafted the first goal. 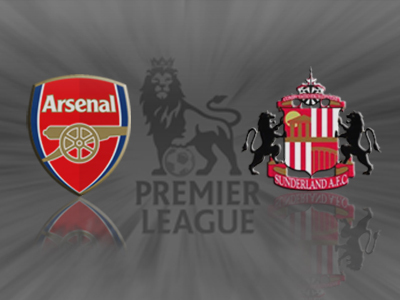 Drawing players in around him, he laid it off to Giroud, who slid the ball past Mannone with ease. 1-0 Arsenal. Sunderland were clearly set up to play with eleven men behind the ball, hitting only on the counter attack. It almost worked when they found acres of space down the right to run into, but Szczesny took a gamble, coming off his line in anticipation of the cross and claiming it well. Podolski was regularly drifting inside to find shooting positions, and it almost paid off when he was set up by Wilshere. The German swung his powerful left foot at it, and fired a rocket towards goal. Mannone got two strong hands on it, and palmed it over the top. A good strike, and a good save. The visitors were then the architects of their own downfall, with a sloppy back pass being easily intercepted by Giroud. Mannone came out to meet him, but the Frenchman slotted it calmly past the ex Arsenal man for his and Arsenal’s second of the game. 2-0. It was pretty much all Arsenal by this point, and it seemed like it was only a matter of time until the boys grabbed a third. That time came shortly before half time, and was most definitely the best of the three. Rosicky laid the ball off and continued his run into the box. After four or five one touch passes, the ball found it’s way back to the Czech international, who dinked it skilfully over Mannone. Vintage Arsenal, 3-0 at the break. Let’s hope the second half is as fruitful.